Carrying the maritime motif of the Beaufort collection forward, this table features a decorative base with four oars carved to scale and positioned atop a crescent shaped oak platform and turned feet. A tempered glass top with an ogee edge keeps the look neat and contemporary. 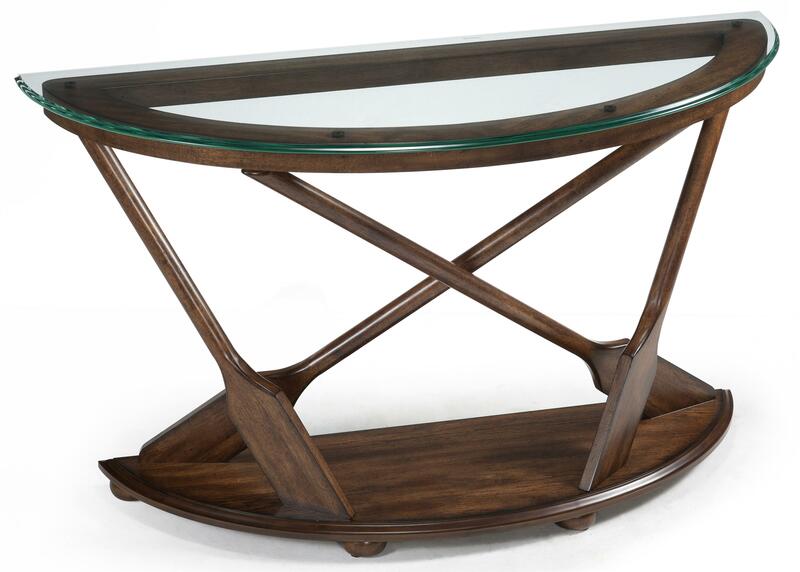 With its demilune design, this sofa table is ideal for hallways, narrow rooms and against the wall placement. If desired, the platform base can be used as a shelf. Pair with other pieces from the collection for a coordinated interior. The Beaufort Demilune Sofa Table with Oar Motif Supports and Tempered Glass Top by Magnussen Home at Furniture Fair - North Carolina in the Jacksonville, Greenville, Goldsboro, New Bern, Rocky Mount, Wilmington NC area. Product availability may vary. Contact us for the most current availability on this product. 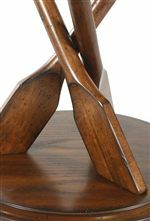 T2214-75B Demilune Sofa Table Base 1 48" 17" 28"
T2214-75T Demilune Sofa Table Top 1 50" 19" 0.511"
The Beaufort Occasional Collection presents nautically inspired tables with physically distressed oaken bases, a Dark Oak finish and tempered glass tops. 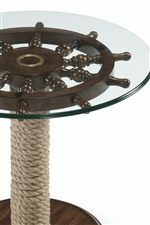 Designed to accent the homes of those who cannot get enough of the open water, each table in the collection exhibits unique characteristics, including a tightly wrapped, rope-wound pedestal base, a ship steering wheel functioning as a support, supports carved to resemble oars and even a cocktail table basin fashioned after a standard hull. Exceeding other occasional table or accent furniture collections in terms of personality, transitional allure and playfulness of design, the Beaufort collection offers an eclectic group of room accents for the modern day seafarer in search of a furniture collection suited to his or her enthusiasm for all things aquatic. The Beaufort collection is a great option if you are looking for Mission Coastal furniture in the Jacksonville, Greenville, Goldsboro, New Bern, Rocky Mount, Wilmington NC area. Browse other items in the Beaufort collection from Furniture Fair - North Carolina in the Jacksonville, Greenville, Goldsboro, New Bern, Rocky Mount, Wilmington NC area.